How many of these clowns are wearing hoodies when there isn’t a camera around them? Exploitation – pure and simple. 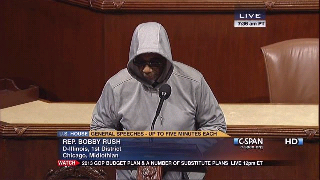 Congressman Bobby Rush had a melt down on the house floor as he donned a hoodie and recited the Bible. He was removed from the house floor.